The School of Law was delighted to welcome Professor Richard L. Roe of Georgetown University Law Centre to Limerick from 28 January to 1 February. Professor Roe was working with Dr Lydia Bracken as part of a Street Law teaching project that she is supervising. As part of this project, six final year law students will teach law at a local DEIS secondary school over the course of the semester. The law students are participating in the Street Law project as part of a final year UL Engage Practicum. 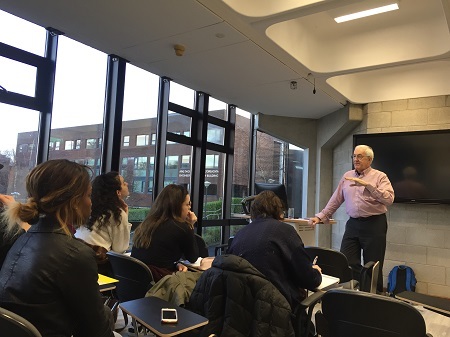 Professor Roe worked with the students during his trip to train them in the learner-centred, non-directional teaching methods that are used in Street Law. The Street Law teaching project is generously supported by the AHSS Faculty Teaching Board Fund and is delivered in collaboration with the UL Access Office. Professor Roe also delivered a public seminar on Street Law at the University of Limerick on Thursday 31 January. This seminar focused on interactive, experiential methodology developed for clinical legal education and allowed participants to engage in, examine and discuss a series of learner-centered activities. The seminar was funded as part of the National Forum Seminar Series 2018/19.